After two weeks of craving curry, we finally took a Sunday evening to make our own curry paste….why did we wait so long? 1. Put all of you curry paste ingredients in a mortar and pestle and pound them until they’re as smooth as possible…this will probably take longer than it will take to cook the curry, but atleast you’re getting a good arm workout. 2. 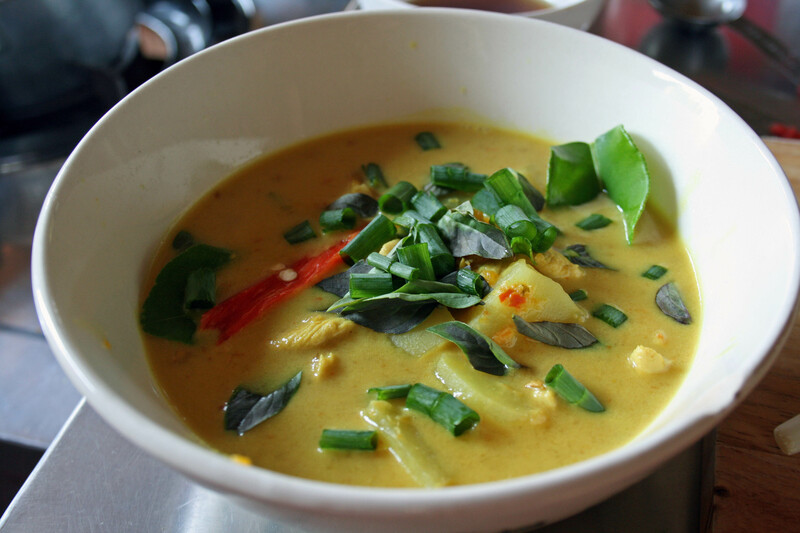 In a medium pot combine the chicken, onion, yellow curry paste and half a can of coconut milk and bring to a low boil. 3. Once the chicken is almost done cooking (this will only be a couple of minutes) add in the sweet potatoes and a cup of water. 4. Reduce heat to a simmer and allow the curry to reduce a bit. The sweet potatoes will take about 12-15 minutes to cook. At this point you can add in the rest of your coconut milk, fish sauce, sugar, and salt. If you need to thin the sauce now is a good time to add the remaining water. 5. Serve with rice and garnish with green onion, cilantro (or thai basil) and fresh lime. 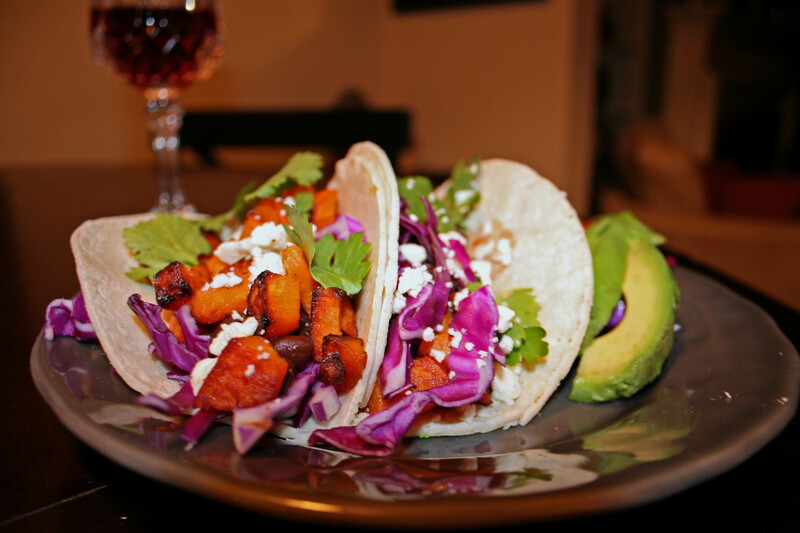 Super quick and easy gluten free, vegetarian tacos!!! 1. In a small sauce pan combine black beans and chipotle and heat over low-medium heat. 2. In a saute pan heat the grapeseed oil over medium-high heat and add the sweet potatoes. Saute until tender and golden. Drain on a paper towel lined plate. Season with salt, pepper, chili powder and cumin. 3. Warm your tortillas and dress them the way you like. 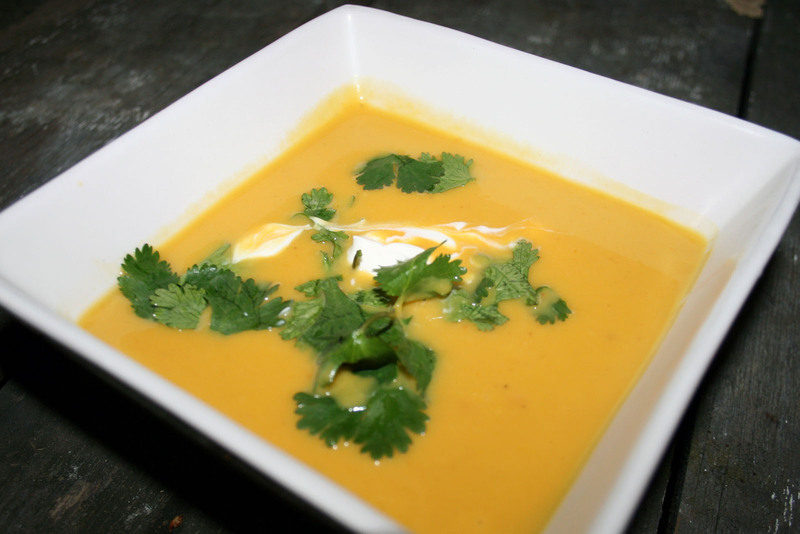 Yep, I’m still on a pumpkin/squash kick….and I’ve been pretty lazy about posting, so I’ll go ahead and start with our Thai inspired curried pumpkin soup. This recipe is so versatile and can be made vegan and gluten free. We made ours with chicken broth, half and half, and butter because we had a little bit of each that we wanted to use before it turned bad, but I actually think the vegan version might be better. Also, this soup was super easy to make…the hardest part was peeling the fresh pumpkin, but with a little patience our OXO Peeler did the trick. A little comfort food for a cool fall day. 1. In a large soup pot bring your chicken broth to a boil on medium-high heat and add your pumpkin. Depending on how big/small your pumpkin chunks are it could take 15-20 minutes. 2. While your pumpkin is cooking, in a saute pan combine butter or oil, onion, garlic, curry powder and chili pepper flakes over medium heat and cook until onion is tender and translucent, probably 5-7 minutes. 3. Once your pumpkin is tender go ahead and add the onion mixture, peanut butter, nutmeg and Worcestershire sauce and simmer for 15 minutes. 4. Remove from heat and slowly add coconut milk or half and half to the mixture. Blend until creamy using your hand blender . 5. Garnish with a dollop of sour cream and cilantro. Note: Toasted peanuts or pumpkin seeds would also be a nice addition. For other great pumpkin and squash recipes I really like this book .